Opposition Congress and NCP in Maharashtra have reached out to Dalit leader Prakash Ambedkar to join their anti-BJP coalition and asked him to send them a draft of how to bring the RSS under the constitutional framework. 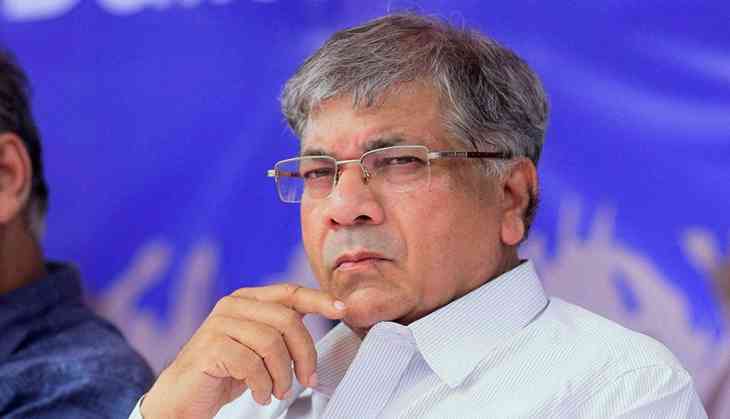 Prakash Ambedkar, grandson of architect of the Constitution late BR Ambedkar and head of the Vanchit Bahujan Aghadi, has put conditions for joining the anti-BJP ''maha aghadi'' (grand alliance) ahead of the Lok Sabha polls. These include 12 Lok Sabha seats (out of the total 48 in Maharashtra) for his party and an action plan from the Congress on bringing the Rashtriya Swayamsevak Sangh (RSS) under the constitutional framework. Senior Congress leader Radhakrishna Vikhe Patil and NCP state chief Jayant Patil on Friday wrote a joint letter to Prakash Ambedkar, urging him to join their alliance to fight against the BJP and the Modi government in a bid to "protect the Constitution and democracy". "In your public rallies, we hear you want a written statement from the Congress on how to bring the RSS in the ambit of the Constitution. Send us a draft of the letter you want and we can approve it. The issue of seat-sharing can also be resolved through talks," they said in the letter. The two opposition leaders said talks have already been held with Mr Ambedkar at various levels, inviting him to join their alliance and that he has been offered four Lok Sabha seats in the state. Odisha: why did MLAs rile Naveen Patnaik by prostrating before him?